The University Library is pleased to announce that access to 5,000 ebooks in the Kotobarabia: Arab Leaders, Historians and Philosophers collection is now available for University of Cambridge users. The Arab Leaders, Historians and Philosophers Collection provides a compendium of early works of an astounding variety of disciplines from important Arab writers, spanning fields from feminism and social theory, to classics of literature, history, and the sciences. Includes works by the Four Imams of the Sunni Sect, the Al Azhar Modern Sheikhs, various authors of the Modern Arab Enlightenment, and rare works by the former Egyptian royal family. Kotobarabia is the largest online provider of Arabic ebooks and one of the leading Arabic digitisation agencies in the world. 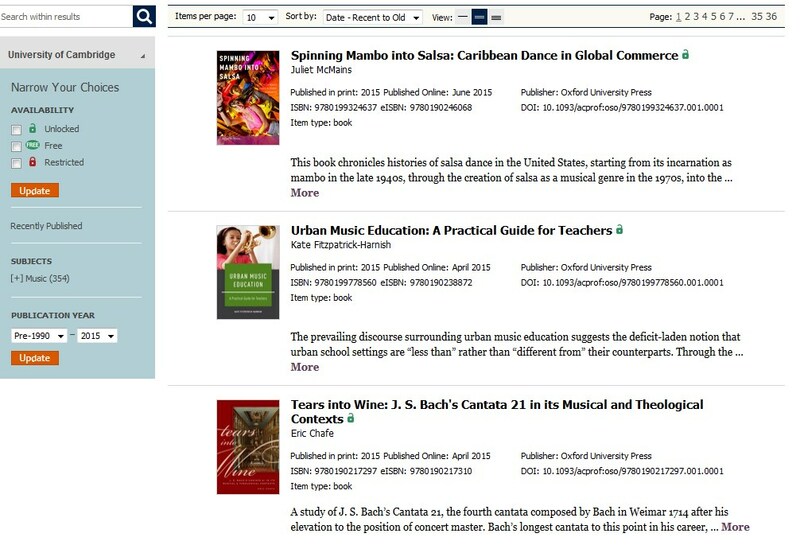 Content is mainly in Arabic with metadata in both Arabic and transliteration, and you can search the platform in English, by author, title, subject and publisher.Titles can be printed and downloaded as PDFs, and users can create their own customised favourite title lists on the East View platform. Searches in Arabic script are supported on the kotobarabia platform. Titles are searchable in LibrarySearch and available both on and off campus (with a Raven login). In the light of increasing numbers of Italian language ebooks becoming available and the growth in ebook production in Italy, we have set up a facility whereby our readers can easily recommend such titles for purchase. Records for the entire Italian-language ebook content hosted on Casalini’s Torrossa platform are searchable in LibrarySearch. Each title is recognizable by the gold ebook icon and clickable text “To suggest this title for purchase please follow the online link and click on the lightbulb icon”. An example is shown below. You will be taken to the details of the title on the Torrossa ebook platform, where you will be able to view brief bibliographic details of the title, read an abstract, and view a sample page. To recommend this title for purchase, please click on the lightbulb icon near the top right hand side of the screen, this will open up a blank form where you are able to write your reasons for recommending the ebook and leave your contact details, preferably name, email address and barcode. Click on ‘Send’ to email this form to the University Library’s Italian Specialist for consideration. If approved for purchase the ebook will be available within 5 working days of your request. You may be contacted by the Italian specialist for further details if required. Once an ebook is purchased, access to it is available both on and off campus (with a Raven login), for unlimited concurrent users. Entire titles can be downloaded for 14 days at a time, after which time they will disappear from your device. You are free to download entire titles as many times as you require, and you may print and save sections within permitted copyright limits. An owned ebook title on the Torrossa platform displays a green PDF icon, alongside View and Downloads buttons at the top of the screen. The University Library already owns the 2014 and 2015 publications of the Language and Literature, Cinema and Theatre, and Cultural Studies ebook collections hosted on Torrossa, so these 266 titles are already available for registered Cambridge users and can be found in LibrarySearch. Do please contact us if you have any comments or queries. We hope that this facility will prove to be a valuable asset and that it will help develop our Italian collections. Our existing collection of titles from OHO has been increased thanks to funding from the University Library. Monthly updates introduce articles in advance of print publication and beyond the book, online-only content ensures the most current, authoritative coverage anywhere. Britain, Gaul, and Germany: Cultural Interactions by Tom Moore from the forthcoming title The Oxford handbook of Roman Britain. Researching Music Therapy in Medical Settings by Cynthia M Colwell from the forthcoming title The Oxford Handbook of Music Therapy. Sacramental and Liturgical Theology, 1900-2000 by Kimberley Hope Belcher from the forthcoming title The Oxford Handbook of Catholic Theology. Oxford University Press offer an instructional video on how to use OHO. Cambridge University Library is pleased to announce that following the purchase last year of three ebooks packages of Italian-language titles on Casalini Libri’s Torrossa ebooks platform, we have this year supplemented these packages and added the 2015 content. The three collections of scholarly titles: Language and Literature, Cinema and Theatre, and Cultural Studies, have had a total of 153 new titles added. In total there are now 266 ebooks available in full-text from the platform link here and they are also searchable in the LibrarySearch catalogue. Full-text access is available both on and off campus (using a Raven login). This includes the facility to download, print and copy and paste from the text. Torrossa ebooks can be read on PCs, Apple Macs, laptops, iOS and Android mobile devices, but not on Kindles, Kobos or Nooks. 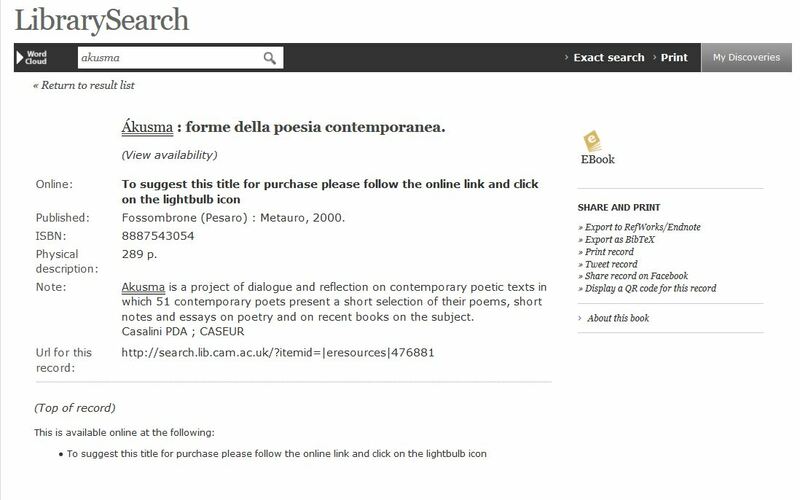 Please do send your feedback on these packages and the usability of these ebooks by emailing Bettina Rex, the Italian Specialist, at the University Library at italian@lib.cam.ac.uk.